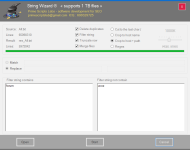 String Wizard is able to process files of sizes 1 terabyte, and more, while not consuming RAM (0.5 - 1 Gb). It has the following features: deleting duplicates, dividing files into volumes by the number of lines specified in the settings. Filtering inclusions, and exceptions, bringing the lines of the reference format to a single format is optional: crop to the last slash, crop the links leaving only the domain, crop the links leaving the domain and the patch.